UPDATE: Be sure to see bottom of story for new information. 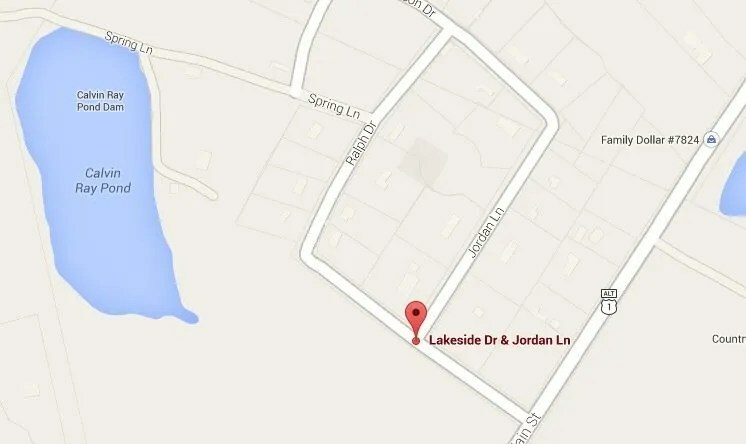 On an otherwise calm and uneventful Saturday evening the peace was broken with a call for first responders for a shooting which resulted in the death of a man on the front porch of a house at Lake Forest Drive and Jordan Lane. The WW2 veteran suspect was searched moments later. This tragic story reinforces why I just could not be a highly successful breaking news journalist. If I was I’d show you pictures that some may consider cruel and way over some line which is hard to define. After contemplation, I’m just not going to do that. What I see through my lens is often never fully shared with readers and the deep sadness of this tragedy is one of those events. Images of loved ones wailing or children with blank disbelieving stares would be here instead. I’m not mainstream media. I’m Wake Forest media. The mainstream media will soon report the news and names of those involved. I’m not going to. And here’s why. 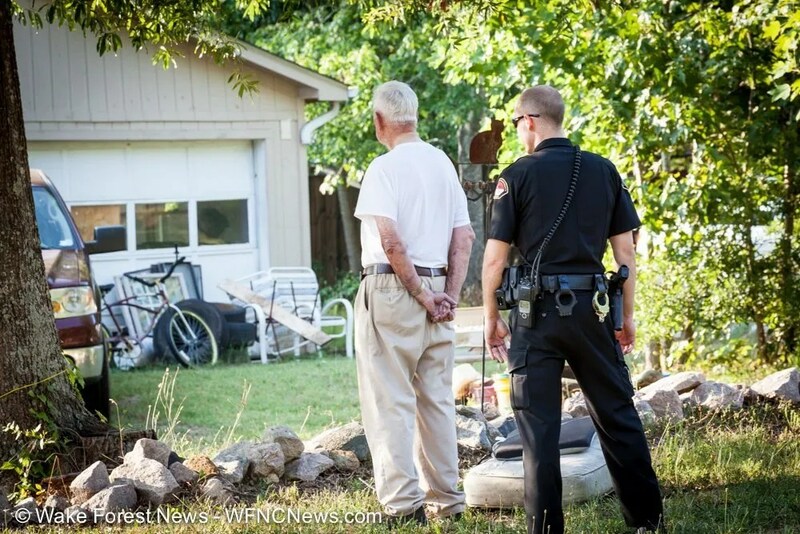 As it stands now a Wake Forest resident who is an elderly WW2 veteran, who some neighbors described as becoming more erratic in recent months, apparently felt threatened and discharged a firearm killing a man on his front porch. 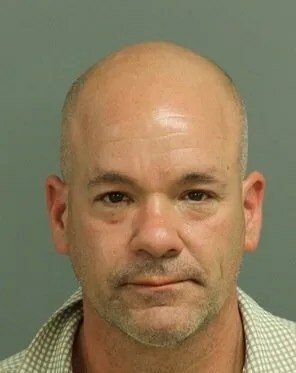 The man allegedly lived in one of his nearby rental homes. But just when you didn’t think it was sad enough, it seems the fatal shot on the front porch of the WW2 vet’s house was delivered while the young son of the deceased man was watching from the driveway. People who knew the man who was killed said he had some troubles in his past but they also said he’d gotten his life back together. Apparently things were looking up for him. I’m sure a lot more will be forthcoming from other outlets but for now, and from me, that will have to do. 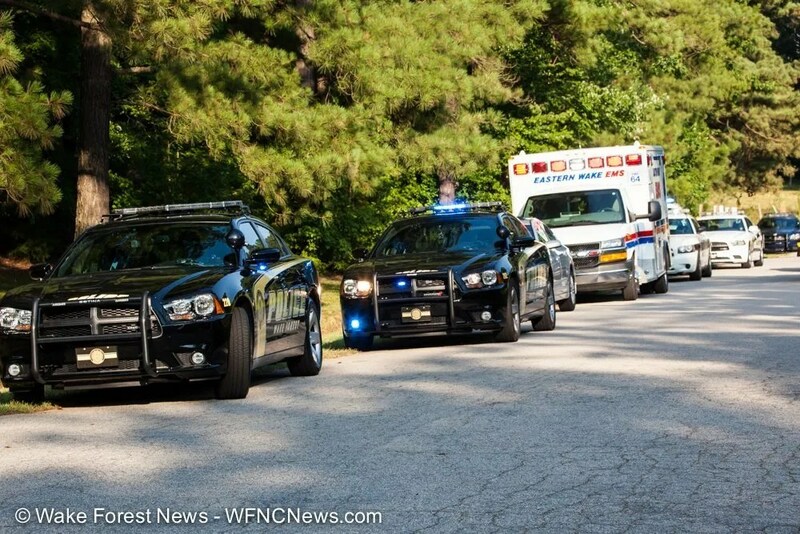 Wake Forest Police were the first law enforcement on the scene with units from nearby EMS and Wake Sheriff’s Office deputies quickly arriving. 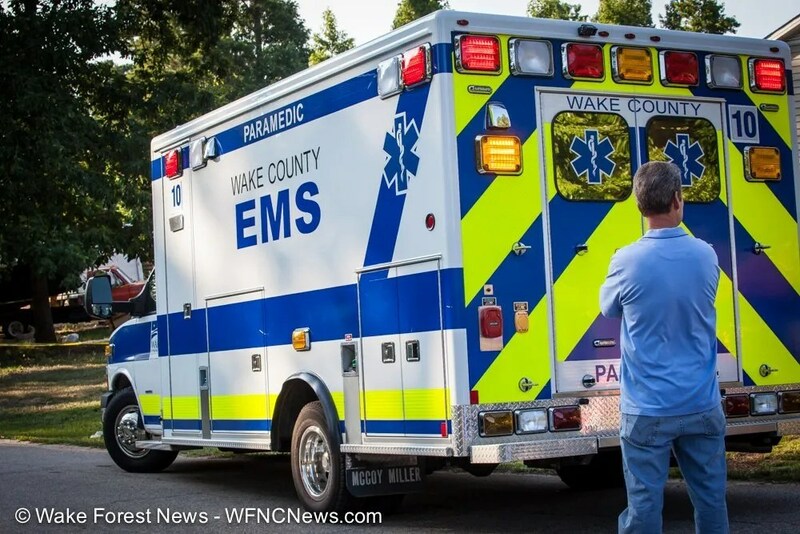 Wake Forest Fire Department Engine 1 on the scene with Eastern Wake EMS, Wake EMS, Wake Forest Police Department and members of the Wake Sheriff’s Office. Wake Forest EMS 10 was on the scene quickly to render aid. WRAL is reporting the following information in their story here. “When Calvin Anderson Ray looked through his peephole and saw Jeffrey Baylon Mitchell on the other end, Ray said he knew it was trouble. The story goes on to say the confrontation was over a broken air conditioner. “Mitchell contacted Ray on Friday to complain about the air conditioning unit, Newton said. A repair man serviced the unit on Saturday but Mitchell said it was still broken, Newton said. The repair man returned to Mitchell’s home but left after he and Mitchell got into an argument, Newton said. Mitchell then went to Ray’s home, Newton said. A 2013 photo of Jeffrey Mitchell. Some have said Mitchell had a long criminal past but was getting his life together. 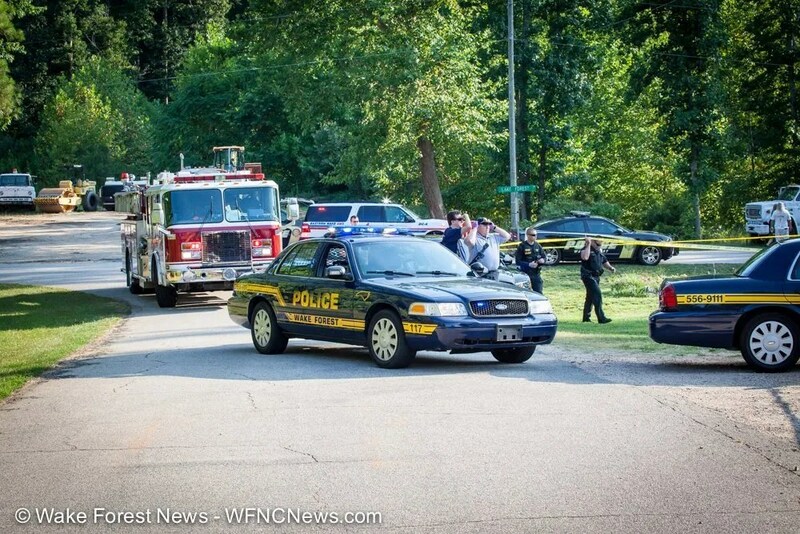 As of the time this update was published there has not been an official statement from the Wake County Sheriff’s Office regarding their investigation. When one become available I will update this story. Truly sad. Thank you for being Wake Forest Media! There is no benefit to anyone to showing pictures of the deceased or the families of anyone involved. A well written capture of this. Maybe in the future you look around they lens of your and get the whole story before you write it..you blamed a WWII vet of a crime when in fact he was defending himself. I'm glad I'm not the only one who has a problem with this story. Fist he's all high and mighty patting himself on the back for being better than the mainstream media for not reporting on the details of this story when the whole time there were more details here than ANY of the local news stations were reporting. I didn't see one report on how the victims son was in the driveway watching the whole thing. Then he pretty much pins the WW2 vet with murder without having all of the details of what happened. Now he continues to update this story in which he said he wouldn't report the names of the people involved. I guess technically he's not doing it by reposting WRAL's story as an update to his story. He's right about one thing, he's NOT mainstream media and thank GOD for that. If someone kicks in a door and gets shot, it is self defense on the shooters part. Period.